The Norwegian Elkhound is friendly, courageous, and a loyal companion who loves to be part of the family. They are known as the extroverts of the canine world because they are such friendly people dogs. They are good natured and loving, yet some have a stubborn streak. They will need long walks, as they need lots of exercise and were bred to work. 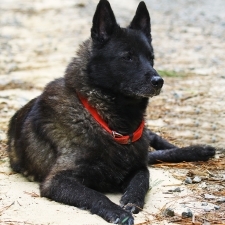 Being very protective and possessive of their family and property, the Norwegian Elkhound makes a very good watchdog. They are highly aware of their surroundings and will alert to anything out of the ordinary. The Norwegian Elkhound does well with children, especially if raised at an early age with them. It is important to be firm with this breed, showing good pack leadership or else they could walk all over you. These dogs make wonderful family pets, as they are extroverted clowns and like to be where the action is. They are extremely versatile and devoted to their family. The Norwegian Elkhound usually weighs up to 55 pounds and stands approximately 20 inches tall. They are a medium-sized dog with a compact, muscular build. Their coat is short, thick and coarse and comes in shades of gray. The Norwegian Defense Minister has the power to mobilize all privately owned elkhounds in Norway for sledding hitches to carry military supplies over the snow in case of war.